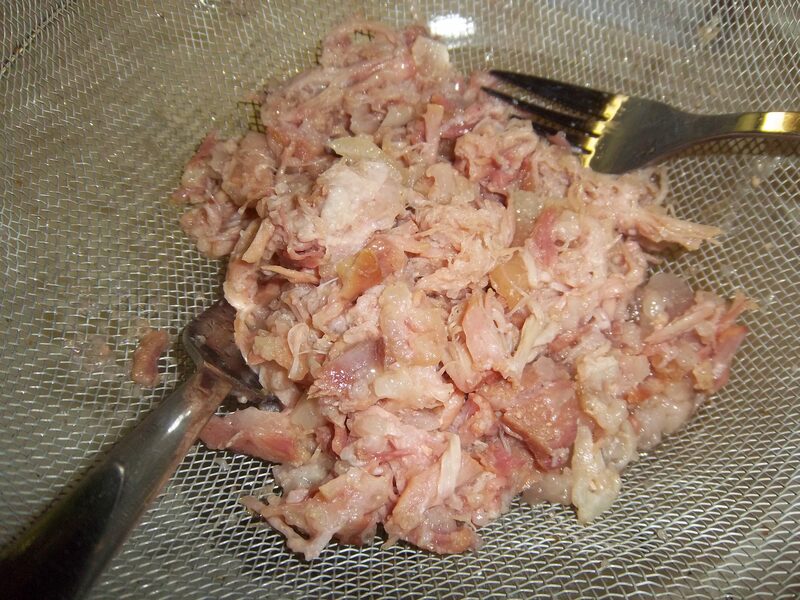 Rillettes are a classic, similar to a pâté in that you spread them on toast and eat them with some nice cornichons, but it is made in rather a different way; long slow cooking with plenty of fat is needed and, rather than being pulverised, they are stripped and potted along with their juices. They are subtly flavoured – the glory comes from the slowly cooked meat and the mild herbs. 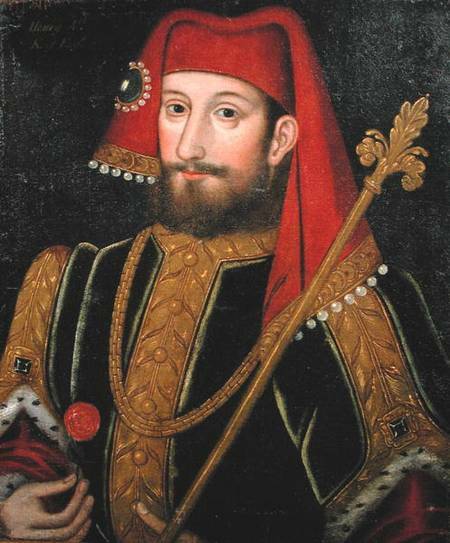 If I were to be a ponce, then I would say they are sublime. However I am not, so I shan’t. Any kind of meat, or even fish, can be used to make rillettes but the classics are pork, duck, rabbit and goose. The best rillettes come from Tours and Reins. 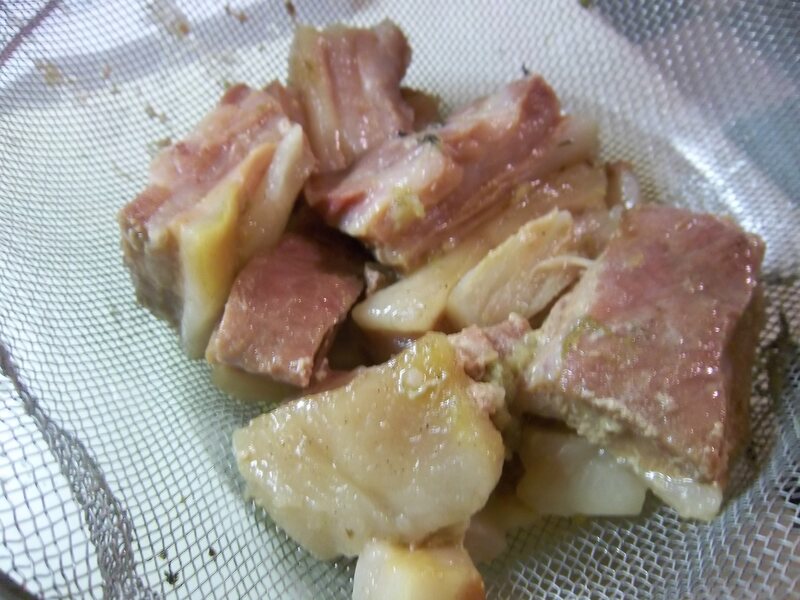 Here’s the recipe I have tried out a couple of times now for rillettes de porc. I can’t wait to get back to England and try some rabbit rillettes (wild rabbits are a rarity in America). There is little variation in any recipe you see, whether found online today or in an eighteenth century cookbook. Technically you can use any cut of meat as long as it has plenty of fat. I have been using pork belly, but neck would be okay, and for the less squeamish amongst you, the head. Cut the pork belly into strips around 1 ½ inches wide, place them in a bowl and rub in the salt. Cover and leave for around 8 hours. Cut the back fat into cubes and place it, along with the pork belly, in an ovenproof casserole or similar. Tuck the herbs and garlic under the meat in the centre and sprinkle over a good seasoning of pepper and a little nutmeg then pour over the water. Cover with a tight-fitting lid or foil and bake in a very low oven, 140⁰C (290⁰F), for 4 hours. Remove the foil and take out the bay leaves, garlic and thyme – they have imparted their flavours. Place a sieve over a good-sized bowl and toss the contents of the pan into the sieve so it can drain. Next – and this the good bit – grab two forks and start stripping the meat and fat into shreds. If it is easier, do this in a separate bowl. Pot lightly into jars, ramekins or earthenware pots and cover with the salty-fatty juices. Keep covered in a cool place, failing that the fridge. Serve with thin toast and pickles. 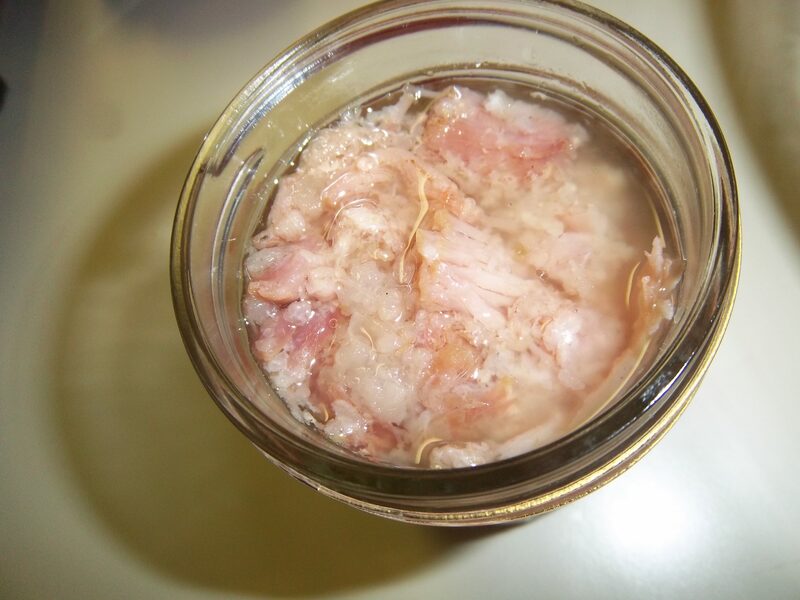 It is very important that the rillettes are spreadable, so if they are kept in the fridge, make sure you let them get to room temperature before eating them.